Makai’s Ocean Energy Research Center located in Kona, Hawaii. Japan, and China also have active OTEC development programs. Connecting power from its OTEC plant to the electric grid on the Island of Hawaii. Because heat exchangers make up about one-third of the cost of an OTEC plant, Makai will develop designs for an OTEC heat exchanger that is high performance, low-cost, and corrosion-resistant. The goal is a product that is essential to developers of OTEC and valuable for other industries that use marine heat exchangers. In addition, Makai will install a 100-kilowatt turbine at the Ocean Energy Research Center to generate OTEC power onto the local grid in mid-2014. 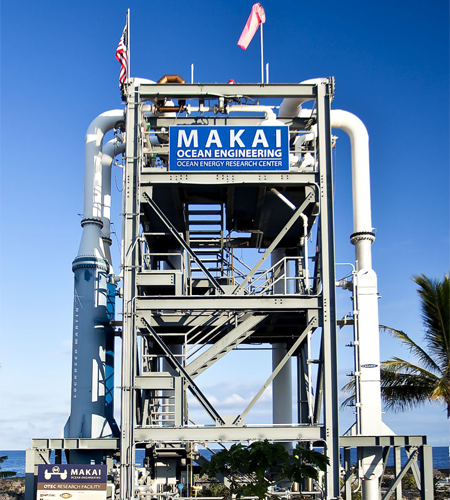 This turbine will make Makai’s Ocean Energy Research Center the largest operational OTEC plant in the world, and the first closed-cycle OTEC plant ever connected to a U.S. electrical grid. By operating the OTEC plant, Makai will gain operational knowledge that will aid in the design of future utility-scale power plants. Makai Ocean Engineering Inc., is the world’s leading provider of submarine cable planning and installation software. Established in 1973, Makai is a diversified engineering company providing naval architecture, mechanical, and software engineering products and services. Areas of expertise include ocean-based renewable energy, heat exchangers, large pipelines, underwater vehicles, submarine cable software and engineering, and general marine engineering and R&D.